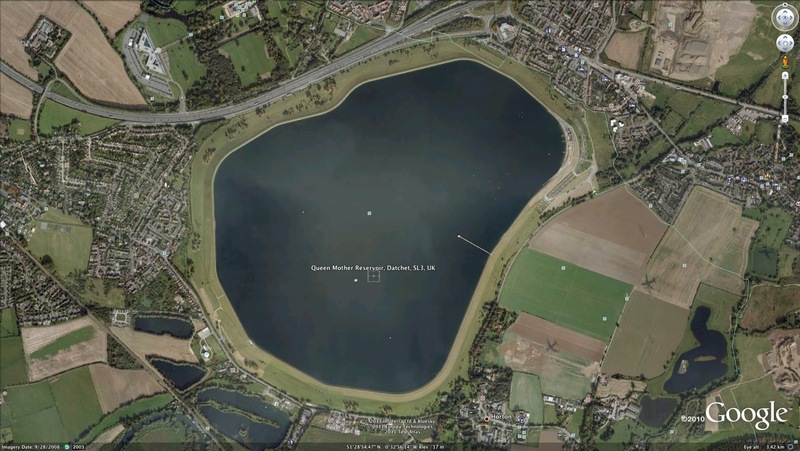 France Worlds SI’s and Other Information Links….!! ….but there aren’t any links on this page!!! 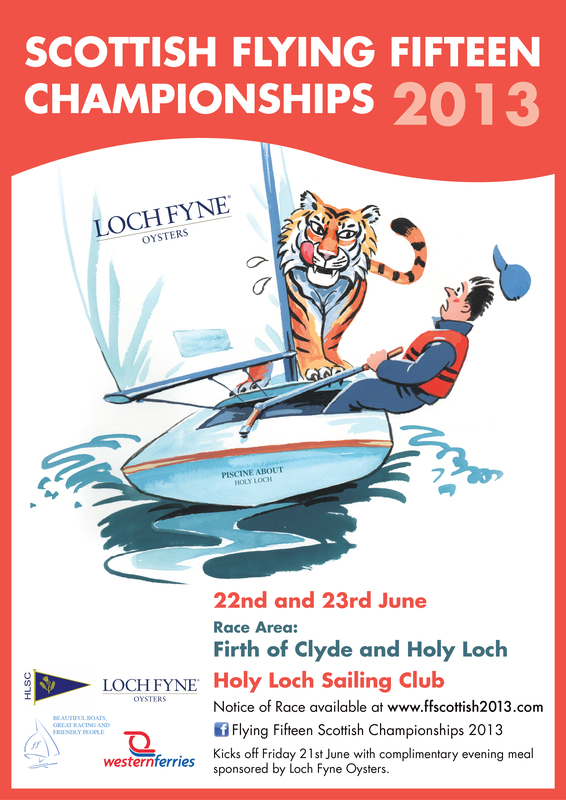 Carbon FFs and the Charm of Resin…..
Like most Club Racers, I wouldn’t know the first thing about the way boats are moulded. I managed to get to see my Dragon being built at Petticrows which was fabulous. All very high tech. You know, at Petticrows they weigh every last bit of materials that go into the boat and predict accurately what it will weigh on the scales a long time before it ever gets there. And that weighs 1700 kilos! I would guess it is the same at Ovington, Composite Craft and the FF Builders. You may recall in the blog a few weeks back there was a lot of discussion about Carbon FFs and the weight. We had a lot of chat about the whole area with Charles during the Datchet Winter Warm Up. Resin is quite a challenge apparently as it weighs a lot…. So what they do is use Uni Directional carbon fibre (less bumps, less holes) and lay two layers so the direction of the strands forms a “V” or chevron shape. Then glass bubbles are kind of pressed in to fill those holes with air instead of resin…. So – all very elaborate stuff – I can see now why it takes a while to get it right. 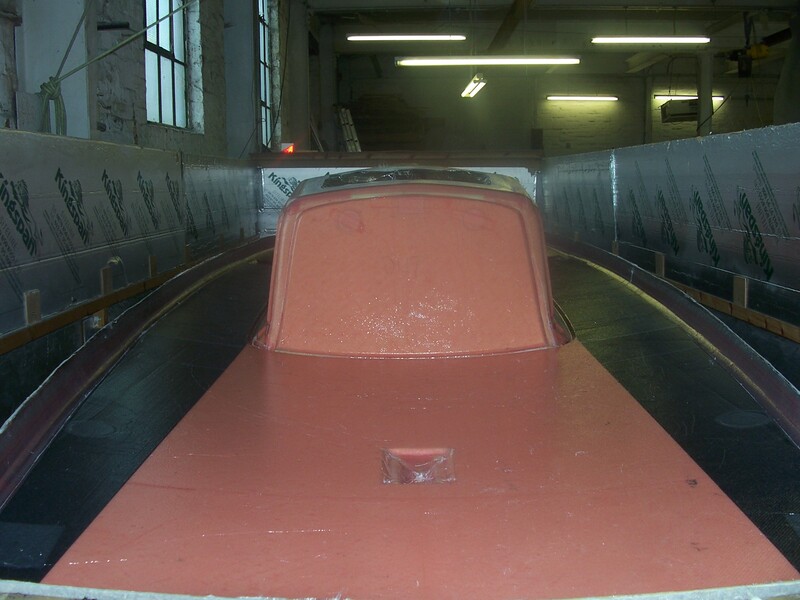 On a fifteen, you want the boat to come out on the weight before correctors are added… so the builders will all have this focus on resin which pushes the weight up….. It might sound OK that you simply add less lead to hit the Class Minimum weight, but it’s quite likely that a boat with a lot of resin has higher turning moments…. I think that’s what part of all the fuss is about. More on Carbon Fibre Fifteens… from Charles…. 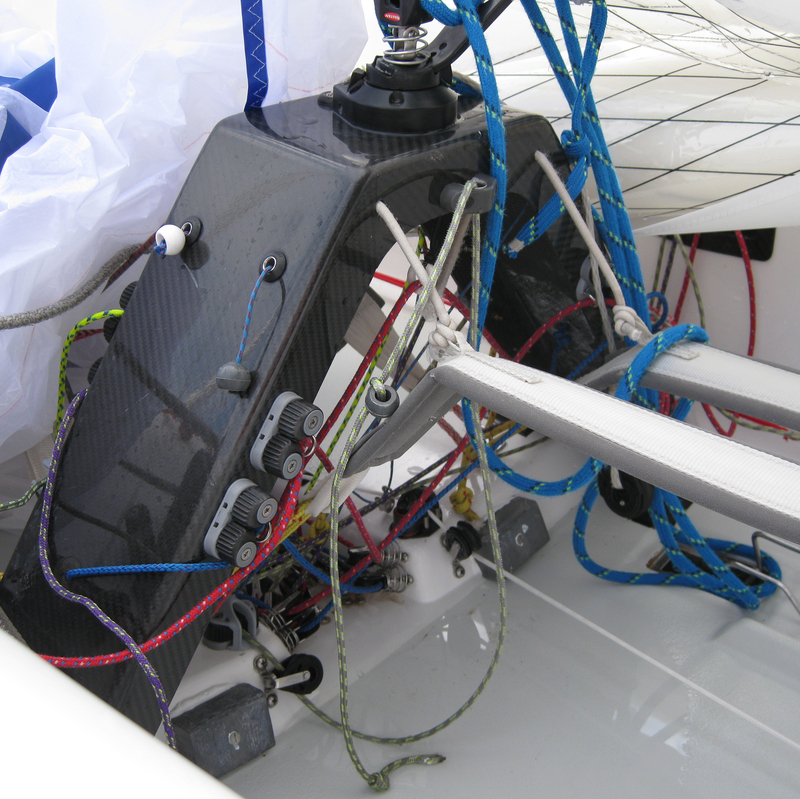 The Ovi carbon boat is carbon on the inside and iI dont think it is vacuumed on. The problem has been the hulls have come out only 9kg underweight. 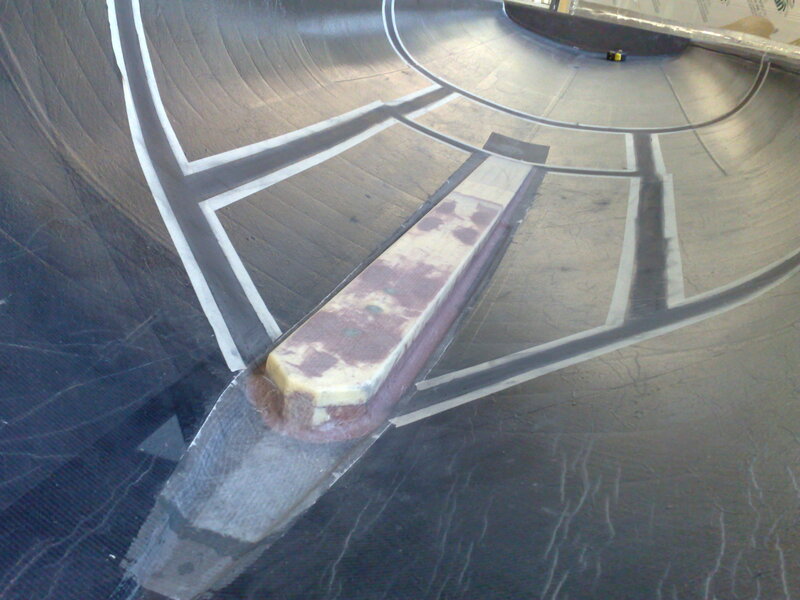 Therefore to wet the carbon out they had put 11kg more resin in the inside laminate. The new boats may be better. As a comparison the boat Gavin built for me was 20.9kg under weight – it has carbon both sides of the hull and the underside of the deck. He charged me £500 for all three layers of carbon pre-preg. 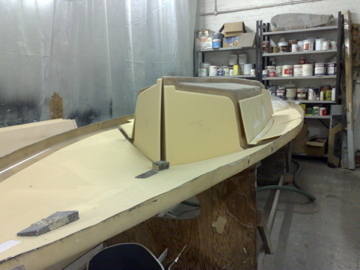 The carbon layer inside will make the boat retain its stiffness a lot longer, so it is a good investment. Carbon cloth is fiddle to fit and a lot more difficult to wet out, that is why it is easier to use pre-preg, which fits dry into the mould than manually do a manual wet out – that it why Ovi has to charge more. I distinctly remember as we took the keelbolts out, a steady trickle of water emerged – and not from within the hull either, which was bone dry…. I guess the keel platform, the hog, was made of hardwood and was gradually giving up the ghost and letting water in. 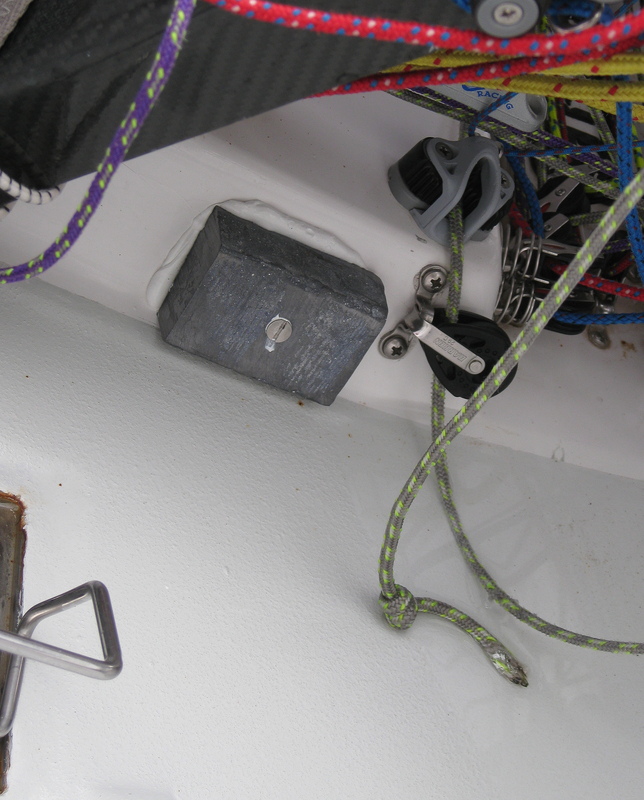 In fact, when we had the boat back together we found that the keel did a sort of reverse cant operation on each tack – a bit like a 505 gybing centreboard ! Much bar talk ensued afterwards about whether it would improve the upwind performance – the keel being more upright no matter how much we heeled! So how do they give us a rot proof keel platform in new boats?? This is the keel platform in Charles new Composite Craft Fifteen. You can see how well bonded in the platform is. It doesn’t look like wood, so I’ll have to ask Charles what it is made of next time I see him…..
Composite Craft – Making the Deck…..
Have you seen the way that decks are moulded? It always struck me as counter intuitive that they are done upside down … I don’t know why I’d have that notion – stupid really, but that’s the way it’s done. If you think back to making jellies in moulds as a kid, you’ll very quickly work out that a complex shape like a deck mould is very clever if you to make in one piece. 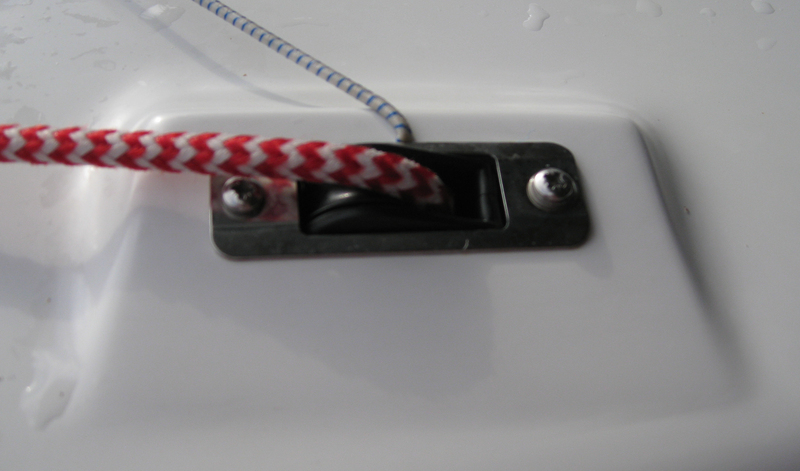 I would guess that there are all sorts of trade-offs and come to think of it, my Ovi X has a two piece deck moulding – there is a kind of foredeck slot that must be bonded on last. 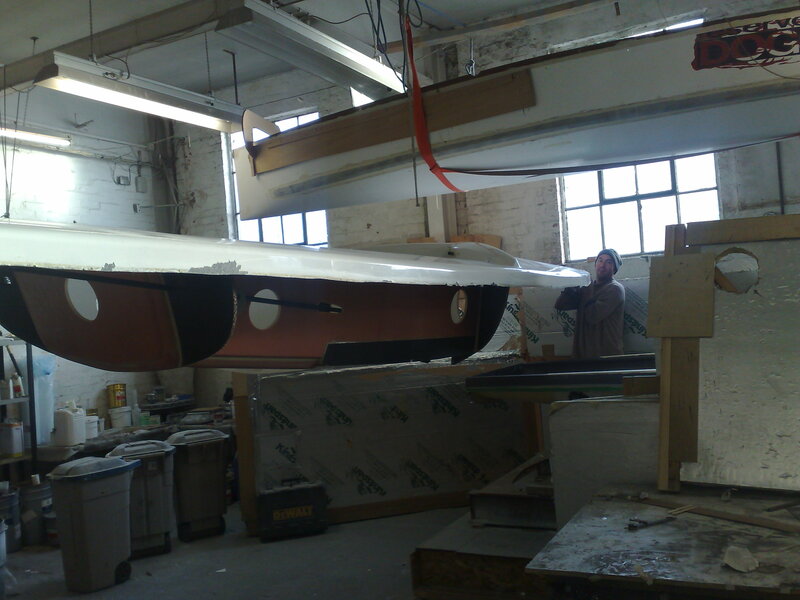 These three photos are all from Charles to give us some idea of how this part of the carbon boat project came together. 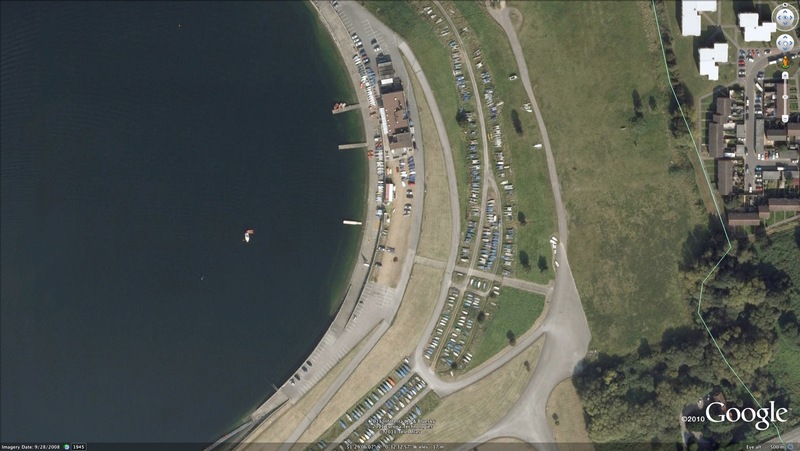 Ovington and Composite Craft Spinnaker Sheaves….. This is the Ovington idea, It looks a bit frumpy somehow, but those micro blocks are very light and easily replaced. And my goodness, they run exceptionally freely. So looks aside, I’m pretty impressed actually. You can also get at it easily if anything goes wrong….!! The next photo is the Composite Craft Fifteen sailed by Charles. You would have to say that the frumpiness isn’t there! I can’t identify the fitting for the moment, but I guess it is some kind of very free running ball bearing block. Access for replacement looks easy enough too. What about threading the sheets through? Hmmm…. It would be totally unlike Charles to have a fitting back there that is heavier than the Ovington solution, but with the metal casing I suppose it just might be. Maybe the Ovington has more weight in the fibreglass to build up the housing….. So …. a big “hmmmm” on this one….. The Composite Craft Flying Fifteen Cockpit…. This is the cockpit of the new Composite Craft carbon fibre Flying Fifteen. Now what can we learn here?? Well to start with, the cockpit looks a bit roomier than an Ovi, don’t you think? This is mainly because the side tanks are made as narrow as possible in the rules, so Charles says, to hang out harder – Argghhh !! Then what else can you see here? What do you think of the console? You can certainly move past it a lot more easily than the Ovi Console in a narrower cockpit…. Note the offset bailers too. And generally note the amount of carbon trim around the cockpit – the jib tracks, the genoa platforms – and you can see clearly how the spinnaker sheets emerge from the tanks right up on the centre line…. they are the odd shape black fibre oval shapes in the picture. Note the flashy spinnaker sheet takeoffs too. It would make a pretty good “RS Flying Fifteen”, don’t you think? Charles’ Carbon Flying Fifteen from Composite Craft…. Have you seen a Flying Fifteen in the Mould? I must admit – I haven’t. Newcastle is a heck of a way from Kent… and though I’ve had three built at Ovis, I’ve never been to see it in process. I have though been to Petticrows at Burnham and seen the Dragon building multiple times – my own Dragon included. Same thing really!! 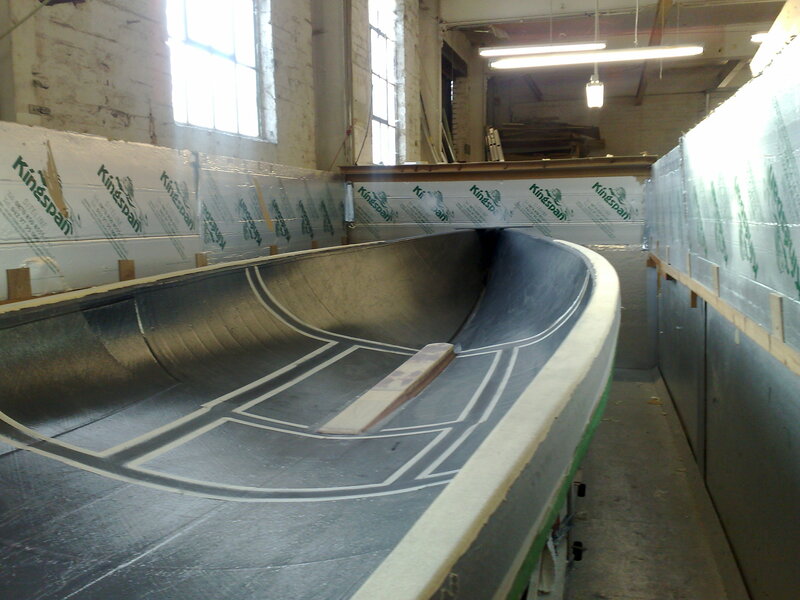 But I never saw a carbon boat in the mould…. Composite Craft – Genoa Tracks…. 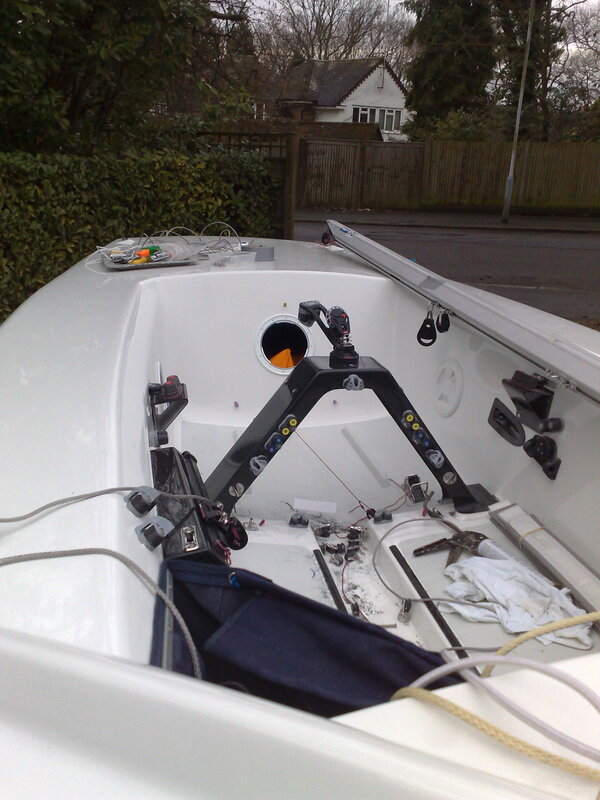 This is the jib car arrangement on Charles’ smart new Composite Craft boat. Note the pretty thin jib sheets – Howard take note! In keeping with the boat, it’s all in very smart black carbon, and if memory serves me rightly they have positioned the tracks slightly more toward the stern relative to Charles’ earlier boats. 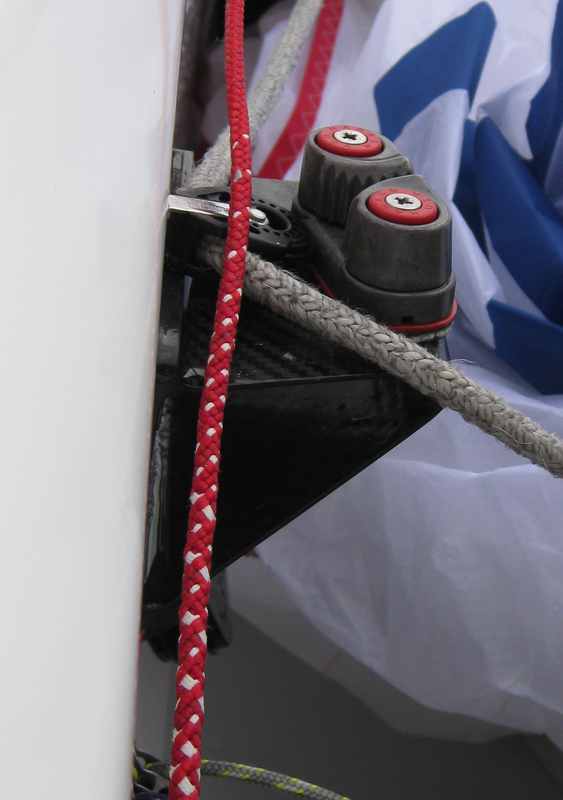 They get extra points for the very neat way the control line disappears through the sheave and out of the way…. 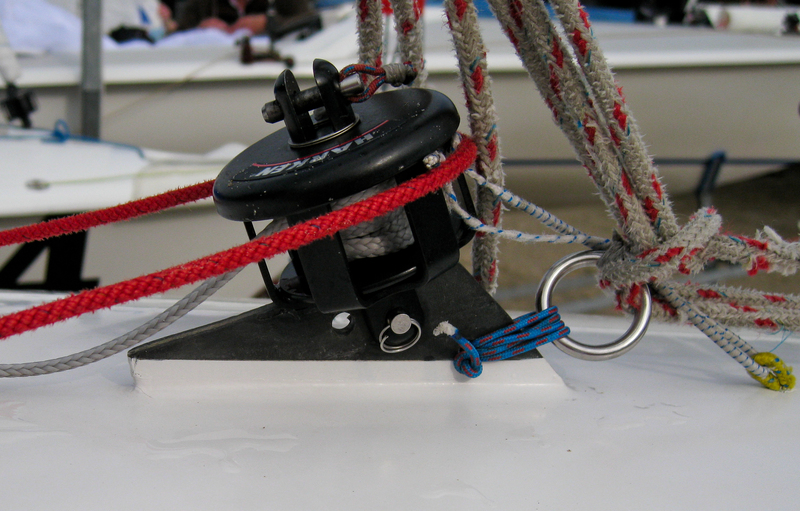 Jib Tack Fitting on Composite Craft FF…. Much better than on my boat I must admit…. Flying Fifteen – A Carbon Copy…..
BIFFA President, Sue Bannister, came over for a drink after work a short while back. Great conversation all evening, of course. One particular item caught my attention – Sue has had a race in Charles Apthorp’s new carbon boat from Composite Craft in Cowes. Charles has told me lots about the boat, and regular bowman, David Rickards, has confirmed to me that he thinks it’s quick. Sure enough, Sue says it’s definitely got a speed edge to it. It has a wider cockpit with narrower side tanks, so you can hike it harder – and downwind Sue says it just flies. This is all very encouraging for the Class – Ovington build a marvellous product (I’ve bought three from the factory!) but I think another good builder will just stimulate the market for us. I really do hope they get some success. No surprise here – the Console in the Composite Craft Flying Fifteen looks a lot like a Dingwall. That’s by no means a bad thing and this one is finished in fabulous looking carbon. You’ll note too plenty of room to move your helmsman’s feet forward of the console and also the location of lead correctors right down in the double floor. The self bailers are also set away from the centreline to bail best at a slight heel. What do you think of the genoa turrets on the new Ovingtons?? Actually, I have a feeling that although functional, they do make the cockpit look ever so slightly bathtub like….! I quite liked the old Phil Evans alloy platforms…, at least my bath doesn’t have those, and you can tuck control blocks inside it out of harm’s way. But how about THIS !! A carbon fibre genoa platform aboard the Composite Craft Flying Fifteen sailed by Charles Apthorp. 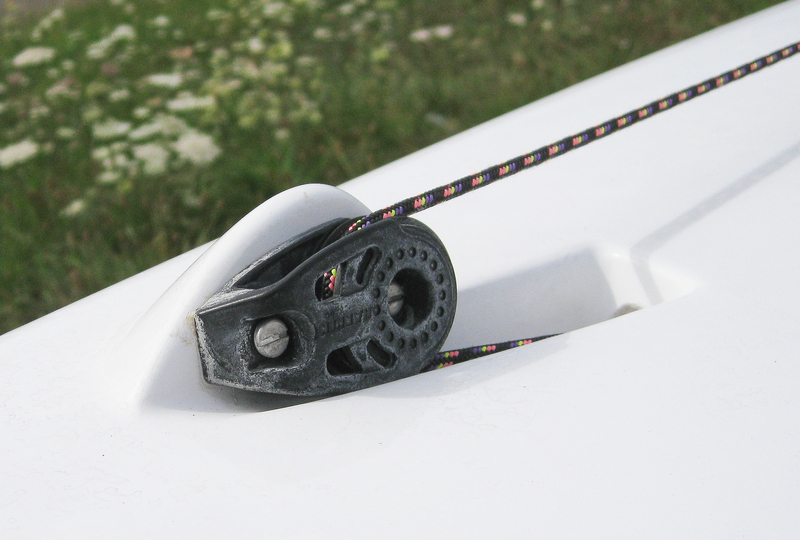 Keep Weight Low in the Boat – Composite Craft Style!…. 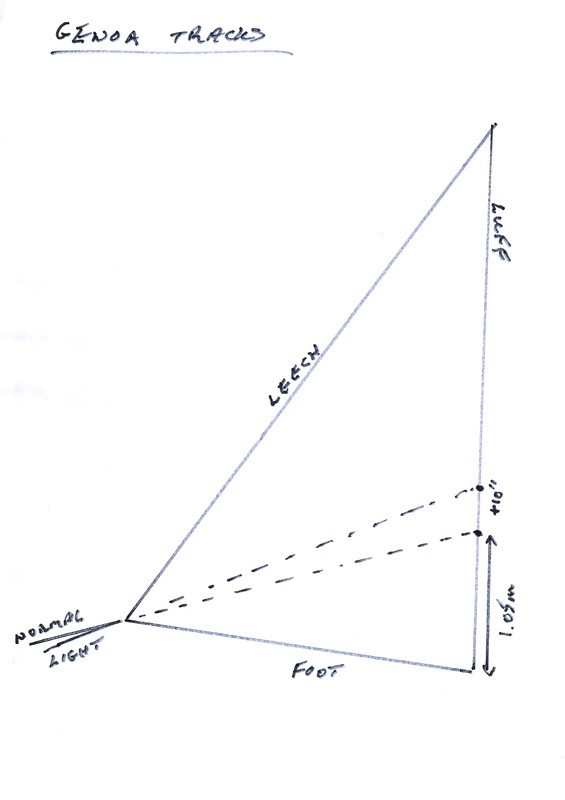 You’ll know how important it is to keep weight central and low in the boat… Where are your correctors?? In my Ovi they are bolted inside the central console on the forward face of it…. Can it go lower?? Well, this is how it is on Charles’ new Composite Craft Fifteen – the lead actually is let into the double floor – can’t get lower than that ! !